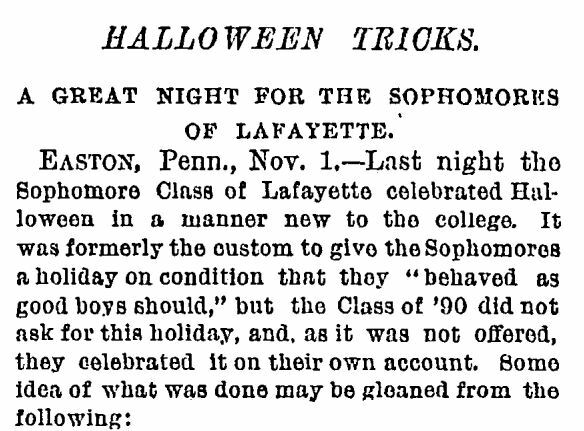 How was Halloween celebrated in the 19th century? In honor of the upcoming Halloween festivities, let’s take a closer look at how the holiday came to be, and how it was celebrated by some in the late nineteenth century. Irish immigrants not only brought over 1,001 potato recipes and green beer; they brought their tradition of Samhain (don’t even try to pronounce it), which is Gaelic for “dead people, please don’t wreck our harvest or kill our sheep.” It marked the end of the harvest season and coincided with All Saints’ Day. When preparing their feast tables, families would set a place for dead loved ones and tell stories about them (don’t know if the stories were flattering or not). Even once Christianity had a firm hold on Gaelic culture, people believed that mischievous evil spirits walked on the Eve of All Hallows (Saints)’ Day, so masks were used to “fool” the spirits, or in the case of the Scots, to impersonate deceased loved ones. When a costume or antic was particularly entertaining, the young people would be given apples, nuts, or small cakes. At a time of year when daylight was in short supply, fire and light were central features of the celebration. Bonfires were lit, turnips were hollowed out and a candle put inside (one source I checked says this was considered mischievous, but I couldn’t confirm that). Once the Irish were established in America and celebrating their homeland traditions, they found that the indigenous pumpkin was much better for carving than turnips. The celebration was especially important for these folks. The time of plenty was over; they were bracing themselves for the long winter to come, assessing their harvest stores, hoping they had enough to last them and their livestock until spring. Sometimes Nature doesn’t cooperate, no matter how hard one works the land. That’s one of the reasons so many Irish wound up emigrating to North America. When the potato blight struck Ireland in 1845, famine became a hard reality, as potatoes were the staple of the rural Irish diet. Between the blight and British laissez-faire policies instituted once Sir Robert Peel resigned (the Whigs then took over and rescinded the various relief measures that were aiding the Irish), the people of Ireland were literally starving to death, unless disease took them first. Opportunistic landlords, looking to kick out tenants so they could plow up the little pockets of potato fields that were interfering with their plans for large pasture grazing, offered families passage to Canada (and promised them all sorts of things they didn’t intend to deliver). The ships came to be called “coffin ships” because of the deplorable conditions – it was a wonder any survived the trip. From Canada, some Irish crossed into the United States, although it was a lot more difficult to get into the U.S. than British Canada. Within a few decades of the wave of Irish immigrants to the United States, Halloween celebrations grew more generally popular. It’s easy to imagine the success of that activity, isn’t it? Wow. 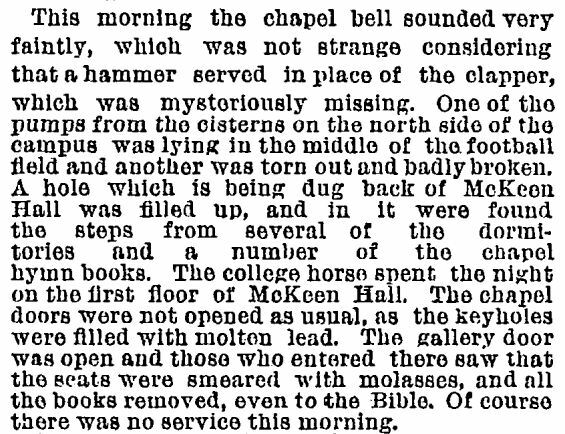 I’m still getting over the horse in the Hall. They were busy. What are some of your favorite Halloween traditions? I’d love to hear from you. They are so adorable when they’re little, aren’t they? I have fun giving out the candy. We also get a lot of teenagers trick or treating, and they are surprisingly nice and respectful! So glad you could visit, Kerry! Loved this! Thanks for sharing!! It is perhaps a sign of my age that I marvel at what some folks in the 1800’s could do despite a lack of electricity. I have to wonder at how exactly they managed to pour molten lead into the keyholes without suffering serious injuries. That must have taken some talent! They were obviously not lacking in ingenuity, lol. I suspect there was a local smithy that made the molten lead obtainable. And most of the larger eastern cities – Washington, Hartford, New York, Philadelphia – had electricity by the 1880s. Still, it’s a fascinating time period! So glad you could stop by for a visit, MaLinda – thanks! Love this! I would have loved living in the 1800s, methinks. LOL, Renee, you are a resourceful lady, and methinks you would thrive in nearly any time period. Thanks for the visit! Love this post and just tweeted it. Happy Hallowee’en. Thank you, Lindsay! So glad you enjoyed it. A Happy Halloween to you, too! GREAT post, Kathy. History, the Irish, Halloween – love it! Nuts in the fire? Ah-hahahahaha. Sorry, I’m a child. Speaking of being a child, I haven’t bobbed for apples in ages. Why? I need to! Happy Halloween! So here it is, a year and a repost later, and I’m finally seeing that you posted a comment, Tiffany! *smacks forehead* Hope you got to bob for apples, but if not, there’s always this year! Thanks for visiting, and so sorry for the delay! 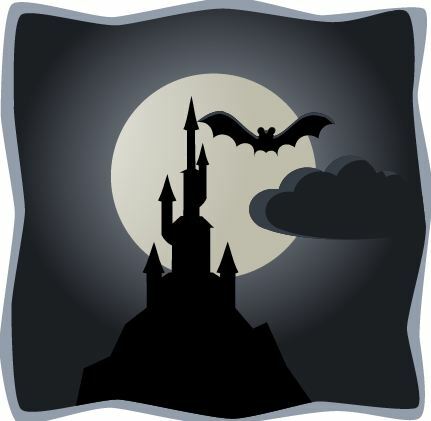 Fantastic – wonderful lesson on Halloween, which is like my FAV holiday! Natalie, I can’t believe I didn’t notice your comment last YEAR – yikes! Thanks so much, and enjoy your celebration tomorrow! Great post. A very representative story of my dad was his Halloween confession. He and some friends put melon rinds under the wheels of a teacher’s car. They waited for the teacher to discover their mischief, but instead of glee, my dad felt guilt. So he went and helped the guy undo the trick. What a heart he had for everyone. Wow! I never knew Halloween originally came from the Irish. My husband is Irish-American. He’ll be excited to hear this. Thanks, Kathy! Kass, I hope you and your hubby have a fab Halloween! Love the history of it, thanks K.B.! So that’s where National Lampoon got the idea for a horse in a college office! I do love Halloween, thanks for sharing! I had never heard of the 19th century rituals, and I’ll have to kiss the next Irish person I see to thank them for bringing their traditions to the States. 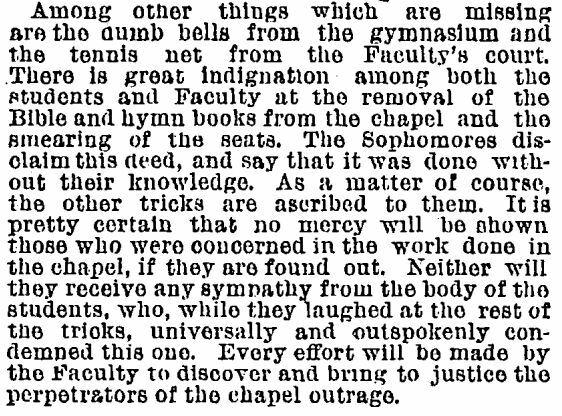 Those 19thc college kids were a wild bunch. I borrowed it for a scene in my sequel, too! Glad you could stop by, Serena, and Happy Halloween! Halloween is my favorite holiday. It was fun to get more tuned in to the origins. You bet, Zack, and thanks for checking it out. Happy Halloween! Wow, the college class of ’90 was a mess! (That was my class too…although 1990.) I loved reading about the history of the holiday. I definitely think the switch from turnips to pumpkins was a good idea.